We are a worldwide community of independent food writers who share a common passion for food, wine and words. 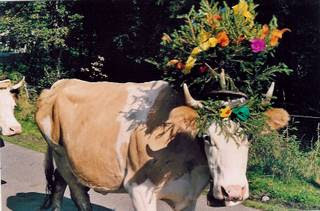 As the days shorten and autumn approaches, numerous festivals in Switzerland celebrate the end of summer as the cows wend their wistful way down from their alpine meadows. 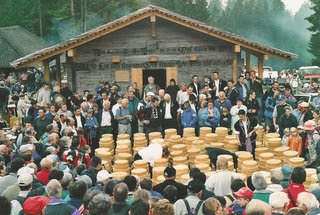 One such is the annual Chästeilet which takes place in the Justistal above lake Thun in central Switzerland each September. Here, the cheeses that have been made on the alp during the summer months are divvied up amongst the farmers whose cows have grazed there. One sunny September day we set off from Beatenberg high above the lake, joining the throngs of people heading up the mountain track to a flat, wide open clearing where the cheese distribution would take place. 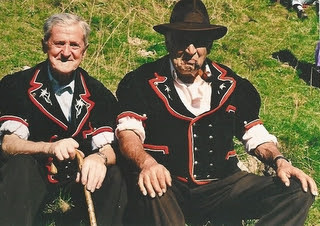 Most were on foot, some travelled in tractors or little Aebi trucks pulling trailers full of happy, shiny people perched on straw bales and dressed in Swiss local costume. Up on the plateau, a real Volksfest was getting underway – reminiscent of a British point-to-point event, complete with all the same smells of musty tents, damp grass and dogs but without the horses. Farmers in short-sleeved black broidered smocks, white shirts and snappy black needlecord trousers milled around waiting for something to happen. There was the sound of alphorns, piano accordions, and the occasional burst of yodelling. At 11 o’clock punctually, the doors of the ancient, wooden storage huts were unlocked with great stout keys and the cheeses (of varying dates and dimensions, 270 of them from ‘our’ hut) were passed out hand to hand along the line, and stacked up neatly on wooden planks. Our host for the day, Herr von Allmen, made an elegant speech to thank the dairyman and explained the (arcane) distribution system of cheeses. One by one the farmers came forward to claim their pile, staggered away with the cheeses and stowed them in the back of pickup trucks. Some would be sold down in the valley, but most would be stored in the farmhouse cellars, to be used in raclettes, fondues and sundry cheese dishes throughout the year. At the end of the day the cows set off down into the valley once more to regain their winter quarters. Turning grapes into . . . bread? !